Every year we do a review of what went well here at The Abundant Artist. We’ve usually shared behind the scenes glimpses, which we will do, but I wanted to start off by sharing some of the major victories of 2016 for artists in our community. I sent out an email last week asking TAA Community members to let us know about their major victories. TAA Community members are artists who have purchased courses from TAA, and therefore have access to our private student Facebook group, which is the heart of our community. There are a lot of artists who previously believed that there’s not a living to be made in selling fine art. By far one of the biggest takeaways this year was that TAA has inspired dozens of artists to believe that its possible to make a career out of art. 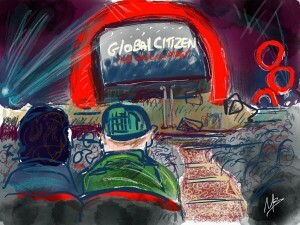 Here’s a story from Dorothea Leblanc that illustrates this change. 1. After starting the HTSYAO course in February, I finally believe I CAN be an artist, I CAN sell my work and I CAN approach people about my art. 2. This year I approached a few stores and they’re selling some of my landscape cards – yay!. 3. I have found my niche! I was painting all over the map before this year and have decided to hone in on my most favourite type of painting, which I call “Heirloom Art Pieces” – they’re a highly textured form of abstract art that I’ve been doing for over 6 years (undercover). It is distinct and unusual and I’ve not found anyone doing what I’m doing so far. 4. Last year, the thought of success was scary, but thanks to TAA, I’m also getting past that. B. The biggest difference between my art business from last year to year is: I didn’t have one. 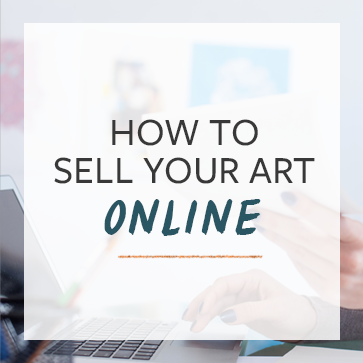 Lots of artists had a signature sale, something that helped them realize that they could go big. From a small commission for just a few hundred dollars to major commission projects for famous Scottish golf courses, TAA artists launched their careers this year. This story from Judy Jacobs is a great sample. But it didn’t end there. Lots of artists had not just signature sales, but also other moments of realization that validated their choice to pursue art in a serious way. I’d also just like to share that as a mom of two, I am so glad to report that my kids (ages 8 and 11) are proud of me and are at an age when they are beginning to see and appreciate what I bring to our family life as an artist. And I am so proud of them. We had a Christmas Art Salon Open House at our condo a couple of weeks ago, and they both dressed up (son in a bow tie and daughter in her Hermione Granger costume) and served hot cocoa to all their kid friends who came with their parents (some of whom bought prints and notecards as gifts). My husband handled the sales and wrote receipts so I could schmooze. Kids and families can be part of our artist adventure and we can feel like a team. It was bonding and fun. I think the kids are learning about small business skills along the way to boot. Deidre had a painting hung in city hall, which you can see at this link. Real financial success showed up for some artists too. Biggest success of the year: creating a cohesive series of work and to date selling a quarter of it. Now I am in the process of narrowing down what I do, and I realise my target market is not as young as I thought it was. Plus I must have sold between 25 and 40% more than last year. Getting hired to create art by Kweku Mandela (Nelson Mandela’s Grandson) who is an activist involved in Global Citizen events. This is the third year he has hired me to create art centered around the Global Citizen event that takes place in Central Park, NYC the past few Septembers. This year he had me create art for 5 of the headlining acts – Kendrick Lamar, Major Lazer, Rihanna, Demi Lovato, and Metallica. He personally handed my art to each artist the day of the event. I blogged about it and how it all came about here – (with samples). It was really fun to teach and collaborate with so may incredible artists this year. The ones who really inspired me were the ones who took whatever we offered here at TAA, and took massive action to grow their art business as much as possible. The best example of this was from Dawn Allen. “My new year’s resolution for 2016 was to follow as all of the free advice available on TAA website and see how far I could get with my new business as an artist. I did purchase the Instagram program and your book. I watched/attended all of your free webinars, read your website, and participated in discussions in the TAA Facebook group. I was starting from scratch with my art business other than about 12 finished pieces of art (and many years of experience creating art). sometime in 2017 or 2018. Marigny Goodyear is another great example. In addition to setting up her website, social media profiles, group shows and landing her first paid commission, she had this to say. “I now have a working routine and days of the week set when I write my blog, tend to social media postings, cold calling and compiling lists of leads, and of course, studio time. The admin to studio time ratio is about half and half for me. Marketing is becoming clearer. This has always been my least comfortable topic but I’m getting the hang of it little by little. I quit my day job!!!!! I find myself in a position where I am able to quit my day job, which I’ve been at for 8 years, and focus on my art business. My last day isJanuary 27, 2017. OMG. Thank you Cory. Your book, videos, short courses and challenges helped me so much think of my art not just as a creative passion, but as a business. I am ready for 2017! Lets do this! The biggest highlights of my year were being chosen, as a Deaf artist, to have a solo exhibition in Paris, London and Bath, winning a big funding grant to take my art and myself over to Europe for my solo exhibitions. This past month and a half, I have sold 9 paintings from my 30 days series, 1 watercolor, and 1 very large drawing. If there is one overall word that I think could describe my main highlight for the year, it would be connection. I send out a weekly email with a watercolor or pen drawing, and a few lines of thoughts about it. Although, I only have a few subscribers for the weekly email, people are loving it, and some tell me waiting for it to come into their inbox. This keeps me motivated and not only connected with them but also connected with myself, my inner source of inspiration, and with my commitment to making art. Here’s a link to Trine’s 30 Day Painting Project. Quadrupling my income! Exhibiting here in Japan. Winning art competitions. I started the year with a large Art Fair and that’s where the networking began; creating opportunities. I received several commissions and sold more than I ever have. Myself as an artist and my artwork was spread through word of mouth. I’ve participated in several Art Fairs throughout the year and had very successful days. It’s helps being the minority for what I do. There are many portrait photographers in the community, and many crafters; but not too many artists who utilize photography, and paint. 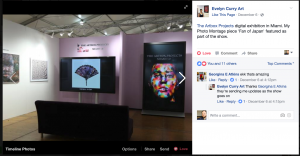 Course, and the Facebook Course through The Abundant Artist. I relocated 4 times and had a baby, so I had to wait until we got situated and settled before putting the course content into practice. I’m a military wife, which means relocating every 3 years. We currently live in Japan, so our surrounding (English speaking) community is small. A large contributor in my year’s success was becoming part of the church community. People got to know me before they knew I was an artist. I think that helped immensely. Everyone is very supportive and connected me to other individuals/forwarded my name when a painting commission or gallery opening came up. In hindsight, I see how useful and essential so much of the TAA course information has been to my art career. I see how people want to get to know you, the artist, and this does influence their decision to purchase; how true it is about repeat customers, building your mailing list, social network consistency. Whew! That was a lot of success stories! I don’t mean to be so excessive, but it’s just a lot of fun. In the next blog post, we’re going to cover the year in review for TAA, the business. Do you have any additional major victories to share? Do so in the comments. I completed a year long course in Color of Woman Training and earned certificates as a Teacher and Coach in Intentional Creativity(tm) with membership in the Intentional Creatives Guild. I created 6 large paintings, several watercolor and art projects, all combined in a Soul Work Project.